Mind-blowing edge hold with an explosive pop! A metal board that rides like an old glass board, but rides like a metal board. The Proteus is changing people’s opinion of what a metal board is. We have incorporated our expertise in glass and metal constructions to provide the best of both worlds in a single board. Riders have asked for it and we have delivered. The Proteus is a carving machine designed for the expert rider who likes a board that gives back everything you give it. If you like a turn that ends with an explosion of energy launching you through the air and into the next, this is one is for you. We have incorporated the latest in metal construction and shaping with a fixed radius sidecut to give you exactly what you have been dreaming of. The Proteus is a carving machine designed for the expert rider who likes a snowboard that gives back everything you give it. If you like a turn that ends with an explosion of energy launching you through the air and into the next, this is one is for you. We have incorporated the latest in metal construction and shaping with a fixed radius sidecut to give you exactly what you have been dreaming of. 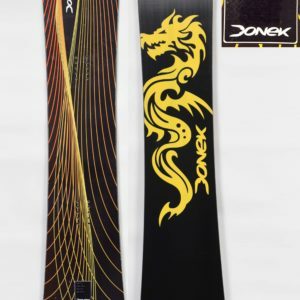 I have been a Donek customer since 2003, this is my 6th board from Donek. I ordered a custom 163 Proteus with a 19.5cm waist and a single 10m radius. I have been in search of a replacement for my 158 F3 Madd’s and finally found it. The board has exceeded my expectation, I love the effort less transition, how it hooks up and stays locked in a carve, and lastly how it holds on ice. The Proteus is easier to ride then my Madd and I have had plenty of days to experience it on boiler plate and very icy conditions here in the New England. Once I had it tuned with a 3 side (87) and 1 (89) base it performed extremely well on ice and held an edge better than my Madd. It is nice to be back on a single radius board that completes a turns and is predictable. I am one of the East Coast Expression (ECES) organizers and can attest that the Proteus line was a very popular board at the demo tent in 2012 and 2014 at Stratton, VT. Everyone raved about the boards and the predictable single radius. If you are carver and looking for a board that finishes a turn, stay away from the race board specs with the large tail side cut and pick yourself up a Proteus, you will not be disappointed.